We're slowly getting more and more details from the camera makers in terms of their overall product positioning as they all get settled in with their full frame cameras and we get hints on what's coming. Yet as I see, read, and hear these details, they still leave me scratching my head at times. If the first camera is the mid-pack R and the RP is a more entry, consumer one, then what's with the f/2 zoom, the upcoming f/2.8 zooms, and all the high-end lenses we know about so far? I get a sense of mismatch when I consider the RF lenses and the R bodies we're likely to have before the end of 2019. Sony's long head start seems to be giving Canon product management a case of the "fits" here. Sony, of course, started with consumer-type lenses and then broadened to the faster, more pro optics. Does Canon think starting with more consumer level bodies but more pro level optics somehow negates Sony's head start? What's the UX really going to be like? We've already got two very different bodies in terms of the user interface. Is Canon in reconsider mode? If so, why? As I've already mentioned several times, I still don't get the M and R relationship. The basic implication is that if you buy into M you'll have to abandon all that and rebuy into R if you want to move up. Okay, so two things: (1) are you sure that's what you want to do Canon? and (2) where is the full M lens set? There will be M users who don't want to buy up, but without a full lens set they'll find themselves stuck. As great as the video capabilities are—particularly the Z6—I'm still scratching my head as to why no lenses match up for video. Oh, there are some surprises under the covers, such as the parfocal adjustments that are being made by the camera with varifocal lenses like the 24-70mm. Yeah, that's good (though why didn't that become a clear marketing message?). But have you actually tried manual focus video with a Z camera and Z lens, Nikon? Everything breaks down at that point, and we all run to older manual focus lenses that have geared rings. You don't have any of those, either, Nikon. Where's the all-in video bet? Halfway doesn't hack it. Video ILC requires both a camera and a lens. Canon has done a better job of describing what their new mount flexibility does for them. We've not seen the lens nor the explanation that tells us why you picked such a close, wide mount (though there were hints in the CP+ interviews). And no, the NOCT is not the answer, as it's way too specialized and not of interest to most of us. The future firmware update announcement was interesting, but raises new questions. Proof will be in the doing, not the saying. I'm not convinced that the Eye AF thing is anything other much more than a narrowing of Face Detection AF. Welcome, but not exactly earth shattering. The real issues most of us have seen with the Z focus system have nothing to do with whether somewhat static people were being focused correctly. I worry that this is "feature checkbox" product development and not true performance optimization. Can we get a clear indication from Nikon that 3D Tracking needs to be fixed? US$2000 can't be the entry point for Nikon mirrorless, can it? Nikon started with the number 6, so they have 1-5 to slot under the Z6. However, note the lens road map: nothing truly consumer in lenses could appear until at least 2020. What will Nikon's real response to the RP be? Obviously a Z5 (lower spec EVF/LCD, SD slot, no top LED, 1/4000 shutter), but what's the lens? Another option in the market is always welcome, but I've yet to see clear messaging that tells me why I'd choose the Panasonic option over the others. A specific feature, such as pixel-shift high resolution is not a system message. We need a strong system message from Panasonic. The closest they came so far is "multiple lens vendors," but I note that Sony already has that pragmatically, and I fully expect to see that with Canon and Nikon, too, as the third party vendors get up to speed with the new mount. Panasonic's pricing was on the high side to begin with. Now with the Canon RP, there's a long stretch from RP to S1. This puts a bit of a damper on potential early sales, which means that the system comes out of the chute just a little slower. Fortunately, Panasonic is in this for the long run, but still, what's Panasonic going to do to push interest early on? Sony has clearly heard the UX issues (small buttons, sprawling menus, etc.). But we're three generations in with little change (other than additions, which inflate the problem). Sony has certainly heard that Nikon got UX right and I suspect we'll all hear that Panasonic did, too. Lucky for Sony that Canon decided to conduct human experiments in UX and is still casting about. We're still waiting for even a small signal from Sony (buttons easier to use with gloves on would be a start). Over a third of the dollars taken in from customers for mirrorless this year should come from full frame cameras. 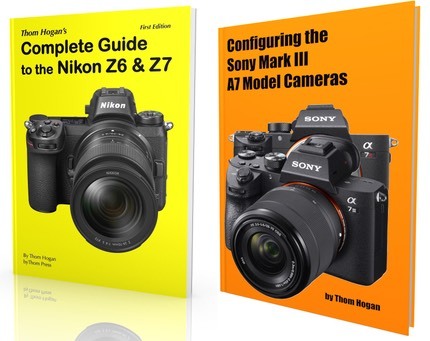 It's extremely important to get strategies and messaging right now that there are four clear competitors (I group all the L-mount companies into one: so Canon RF, L-mount, Nikon Z, and Sony FE).